Asheville buskers have plenty to juggle beyond just their playlists and chord progressions. Peak hours, crowd size, noise levels and time restraints are among their additional concerns and responsibilities. On top of that, a few of these talented street performers have recently endured the harrowing experience of being transformed into insects. OK, so maybe that last part isn’t true. But it is the basis for Bugs!, the latest production and first original musical by the professional children’s theater group Asheville Creative Arts. 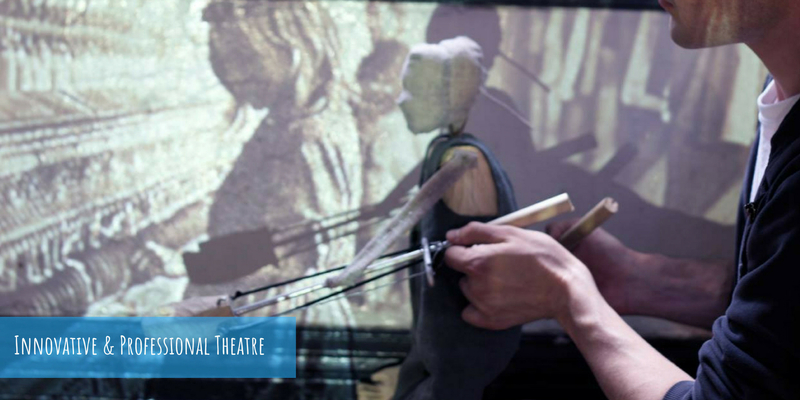 Written by Gina Stewart and Brenda Gambol, the work is composed of a series of vignettes that combine live performance and puppetry. The family-friendly show runs Thursday, July 19, to Sunday, July 29, at The Magnetic Theatre. On its surface, Bugs! tells the story of a band of buskers struggling to communicate with each other. 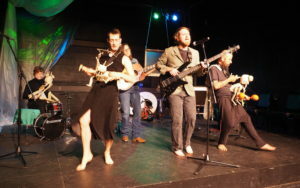 Frustrated by the group’s dysfunctional relationship, its leader (played by local singer-songwriter Laura Blackley), casts a spell over the musicians, transforming the unit into an insect ensemble. The only way for the buskers to return to their former human selves is by opening up to and hearing out their fellow bugmates. Puppets are employed to convey the actors’ transformations. Local artist, puppeteer and cast member Edwin Salas Acosta designed the unconventional creations. “These are not your normal hand or string puppets,” he explains. Instead, the wooden structures (some of which are several feet tall) are strapped to the actors’ bodies. But, because the production is about buskers, musicianship takes precedence over puppetry skills and acting experience. On account of this, many of the performers selected for the musical are new to theater. In addition to Blackley, the show features local musicians Holly Heveron-Smith and Jake Donham. Along with the newbies, Bugs! also includes Acosta and actor Tristan Cameron. “What I’ve found in the rehearsal room is a special group of people who are really in tune with each other,” says Felder. Like music, she continues, theater requires active listening. “That’s kind of the fundamental of acting: to be present enough to listen and to be able to react to what your partner is handing to you,” she explains. Of course, complications have arisen. But they’ve had less to do with eliciting emotional responses or memorizing lines and more to do with manipulating Acosta’s wooden designs. “It’s been really challenging and really exciting at the same time,” says drummer Heveron-Smith, who plays the praying mantis. Heveron-Smith notes that the grace Acosta exhibited in his initial tutorials did not immediately transfer over to her once she strapped on the praying mantis. Unlike Acosta, Heveron-Smith could not carry herself with the same balletic ease. Nor could she squat nearly as low as the skilled puppeteer. But, over time, she says, she has learned to manipulate the puppet, whose legs, she adds, double as drumsticks. Along with individual challenges, Felder notes the chronic obstacle faced by those involved in children’s theater — namely, how to create a show for youngsters that will simultaneously entertain adults. Fortunately, Asheville Creative Arts has identified some general rules for success over its last six seasons. At the top of the list, explains Felder, is relevancy and respect. “You can’t discount the younger audiences’ ability to understand bigger ideas or themes,” she says. Interactive productions also help keep all parties engaged and involved. And layered narratives allow for children and adults alike to pick up on various meanings that a joke may imply. “In addition to what we’re doing with the artists onstage, we have also created a really intentional community engagement component for the works that we do,” Felder adds. For Bugs!, this means a post-show collaboration with a number of local organizations and people who will lead a conversation on the topic of humanity and the power of transformative experiences. The goal, says Felder, is that audience members will take these new perspectives with them and hopefully enter into their own individual metamorphosis that will help bring about positive change.